People often looked for constant technological advancement to gauge the progression of a piece of equipment. One noteworthy evolution in the last 50 years is of mechanical drive. Trenchers used to put stuffs in the ground gradually shifted over the last several years to mechanical drive. Mechanical drives used gearboxes, shafts, pulleys, chains and sprockets to drive the trencher chain. Mechanical drives are used to provide a variable output speed from a constant speed power source or to provide torque increase for a variable speed power source as in an automobile. Mechanical drives are less costly than competing electrical drives and their control is much simpler. The disadvantage of these drives is that they are not durable and cannot be controlled as precisely as electrical drives. They cannot transmit as much power as electrical drives when variable speed is essential. They are used in industries ranging from aerospace to mining and heavy industry. 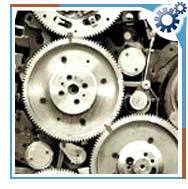 Geared Transmission - Provides specific fixed type ratios. Belt drives - Provide flexibility in the positioning of the motor . Chain Drives - Provide infinitely variable speeds. Traction Drives - Provides adjustabe speed with relatively high speed. With the advanced technology, the working of mechanical drive has become more efficient. Specific characteristics like low-stress, universal mounting, high-strength monoblac casings, high-energy efficiency and low noise level are designed. The monoblac design has increased center distances between the output shaft bearings, making the unit able to withstand significantly higher radial loading. Mechanical drives have internal spaces that have void spaces where residues can be deposited. The system should be cleaned at regular intervals. Clean-in place (CIP) is a method designed automatically to clean pipes and drives. This method is used to clean the void spaces in the drives.